Yes, I am in fact still teaching math. We only have 4 more school days, and 2 of those are booked solid. This might be my last real math class of the year, but there’s still hope for Thursday! This is not my picture! I clipped it from Twitter one day last week and now can’t find the original source! I really wish I had not just saved the photo and could tell you where I found it. But honestly, it was probably around 10:00 at night and I’m surprised I even remember I copied the picture. I appear not to have retweeted it because I have really searched and can’t find the original source. If you know who it is, please tell me! Today I had a long math class (a full 90 minutes, which happens once a week. We don’t always use the whole time, but I am always glad for the extra!) so I pulled this picture up on the Apple TV. We talked about what we saw. Then I asked, “How can this child say that 3 hexagons is equal to 11 other shapes?” I was met with blank stares, which is exactly as I had hoped it would be. I sent them back to their tables with pattern blocks to see if they could figure out what this random stranger was talking about, and if s/he was actually right. I asked him to explain. “Well, I saw that 2 of the red were the same as the yellow, so I just tried out the others and it worked.” Good old “Guess & Check”. As soon as he explained, other people at his table gave it a try. In the meantime, on the other side of the room, another child had discovered the same thing. When I talked to him, he added, “And now (X) is copying me!” The child next to him had made the same representation. “It might seem like copying, but I think X was just learning from you. And look what (X) is doing now.” I asked her to explain, “Well, I wondered if we could make more hexagons with other shapes, not just the red, triangles and the blues.” That inspired the other children in her group to start exploring more options. Could anything be done with the square, for example. I have to say I was pretty happy with the results! There was a lot of deductive reasoning going on as students built one shape and then reasoned that they could build other similar shapes. It was interesting and I am sorry I don’t have more pictures to share! My favourite was a long row of rhombus’ on one side of the balance, and a long row of triangles on the other, all neatly stacked in a row that equalled the length of the rhombus row. She built her own balance! At first I thought she had too many blocks for no reason and was very close to questioning her when I realized it was a model of the balance. I figured out, a few weeks too late, that we need more practice with shape names. But I was happy with the spatial reasoning I saw! So, #SorryNotSorry kids! You may have thought you were finished with the year, but, alas, you were not! And stay tuned to find out what we are doing on Thursday! I’ve learned a lot about counting this year. It’s more than just reciting the numbers – I’ve known that for a while. It’s really important for kids to be able to touch a thing and say the correct number as they recite the numbers. I knew that too. But I’ve started to understand more about how children count and how their counting skills develop over time. My son is in ELK year 1. He started JK 20 days after turning 4. His ELK experience has been different from my daughter, who was 4 years 8 months old when she began. It’s been different for a lot of reasons, but I think this age thing is an important one to note. Spencer started JK being able to count to 10. What I mean is, he could say the numbers in order from 1-10 without errors most of the time. When it came to actually figuring out how many of thing he had, he often made mistakes in his one-to-one correspondence. He’d have 5 things, but count past 10 and then declare he had 18! Eighteen, for a very long time, was his equivalent for “infinity”, the biggest number he could imagine. Over time, I started to notice that he could say the numbers to 13 without mistakes, and that his one-to-one correspondence had improved. He could have 7 to 8 things, and correctly identify that as his amount. A few months ago he was counting the muffins at breakfast. He counted them a few times, touching each as he went. If he made a mistake before he got to 5, he’d start over. I realized he was subitizing and that is how he knew he needed to start over. When he’d correctly counted to 8 twice, he was satisfied that we had 8 muffins left. He was right. I loved that he was double checking his answer, and that he knew when he’d reached the correct total. He can now do that with 10 things consistently. The end of ELK year 1 is just around the bend. Where is he now? He can now recite the numbers to 14 without mistakes. Past 14, he says the correct numbers but often gets the order mixed up. The really interesting thing that happens though is when he gets past 20. Suddenly he is able to recite all the numbers to 29 without mistakes. I think it is because 5 and 25 sound more alike than fifteen. I think he is using some of these as landmarks to keep himself on track. He loses it at fifteen because fourteen should be followed by five-teen and it isn’t. That’s just my theory based on what I know about his language development and the patterns in his mistakes. We have been playing games with dice, and I know he can subitize 1-6. At least he can using the typical patterns of the dots on a regular set of dice. I am going to pull out some dot cards over the Summer and see how he does when the dots are in different arrangements. Spencer has been able to look at a printed numeral and say it’s name for a long time. Now I am curious about how well he can connect that skill to the dot arrangements. Can he match them up? We’re going to do some investigating about that too. The final thing I am going to look at is whether or not he can place some of these numbers in order when they are all jumbled up. Can he do this with the numerals, and can he do this with dot arrangements, putting them in order least to greatest? Finally, I should note that currently 18 is not the largest number he can imagine. Now, the biggest number is “humungous”. Ten minutes is the longest amount of time he can imagine though. If I say we are leaving in 20 minutes, he’ll negotiate for a 10 minute departure time. I should start looking at the way he is developing an understanding of magnitude. We were in the computer lab for the first time in a while. Provincial testing had monopolized all of our time, and the lab time, but now we were back. Everyone logged into Dreambox Learning, and got going on their activities. It’s amazing how a little break from something like this can renew interest! I know that we aren’t supposed to help kids during Dreambox, but I couldn’t pass up this opportunity. I grabbed a spare piece of paper and scrounged around for a pencil. I drew a square, divided it into sections and wrote 10 and 2 along the top, and 10 and 2 along the side. I showed him where his 10 x 10 = 100 would go. Then I said, “You also said 2×2 = 4.” and showed him where that would go. There are two empty spaces. He stared. Then he said, “Would this be 20?” And I wrote 20. “Would this one also be 20?” I put in another 20.” I waited for a minute. He looked at me, and I could tell he needed me to show him more. I started to add them up, writing 100+20=20 on the paper, then he carried on mentally and wrote 144 in the box. Of course he had it right. So…Probability. Likely…unlikely…certain…impossible…fair…unfair…after a few days of working on creating some probability games I felt good about everyone’s understanding of these terms. It was time to get out my mystery box! (I held up the box, a la Vanna White. I turned it this way and that.) I saw that it said ‘probability’ on it, so I picked it up. Wanna see what’s inside?” They did. I gave it a shake, and showed them the contents. Someone called out that there was one jar missing. Most of the class started counting the jars – some by 1s, some by 2s. I covered up the row that had one missing, hoping people would count by 5s, and 2 children did. Eventually we agreed that there were 23 jars. I showed them some samples of the jars, but we didn’t look too closely. “Do you know what wasn’t in the box?” I asked. “Instructions. I am sure there were instructions in here at one time, but they are lost. I have no idea what we are supposed to do with this box. Do you think we can figure it out?” They did. One group started to see some fractions. One jar has 2 yellow and 2 blue, and they said that half of the beads were yellow or blue. They became my jumping off point for the next half of the lesson. I gathered everyone, we talked about what we say, and then I had the fraction “noticer” explain his thinking last. We talked a bit about the connection between saying “2 out of 5 are blue” and 2/5 are blue. “I want you to go back and see if you can build on what C is saying about fractions.” They all did. We talked about this on the board, while I recorded our thinking. I want to provide photographic evidence, but I label their answers with their names (they love it! And it allows me to simply take a photo and then I can use that as some specific evidence of their understanding in my notes, and on their reports.) All of that was still on the board when lunch began. The next day I started with that picture. “O saw our ideas from math yesterday, and she gave you this puzzle to think about. And I notice that she wrote ‘probability’ which is one of the words on our box. What’s the connection?” We talked about how the word experiment fit into all of it too. One of the interesting things that came out was the need to have the jars labeled so that the recorded answers would make sense. Honestly, this is a huge step for the class. They are young and don’t always get that people can’t read their minds. I am serious about that! When I read their work and it is disorganized, they are always so annoyed that I am asking them to clarify. BUT this exercise showed me that they are understanding the need for clarity. Two groups labeled the jars “A, B, C, D”, one labeled them “1, 2, 3, 4” and one used “997, 998, 999 and 1000”. I want to talk a bit about the process of this lesson. It took us about 4 days to get everything accomplished that I wanted to accomplish. Now, I could have covered this material in 1 day, and then conducted some experiments with coin tossing, or random draws of tiles, or “rock, paper, scissors”. These are all things I have done in the past, and things I still might do this week. At the end of the first day, I wondered if it was all going to work out. I assessed the lesson and decided that everyone was just a little bit frustrated with not being able to definitively answer the question “What is this box for?” and yet they were still interested in figuring it out. I felt I didn’t really have much to show for the day. Sometimes other teachers come in my room. I was glad nobody had that day. However, by the last day, I felt that there was some real discovery going on and everyone was doing some actual inquiry and learning. Roughly half of my class this year will be roughly half of my class next year. I won’t be able to use this activity with them next year in the same way. I didn’t think of it until just now, but have not Googled this item. I found out that DIME stands for “Development of Ideas in Mathematical Education”. From a Google Books entry, I discovered they come from England, and that they are pretty much impossible to find now. I should have had some recording sheets besides the instructions. I also found an online version here. Apparently, we are to shake the jar, and watch how they settle in the triangle. Or here, you win if two blue balls touch. This will likely be our Monday math. Just for good measure, I took this picture too, and I was glad for it. At first, they were all about the counting. (We have done only 1 other fraction Number Talk.) One girl said “I saw 1,2,3,4,5 on one half, so that means 5 on the other half, then 5 on the other half, so that’s 15. Then 3 more, so there are 18 pieces of pizza.” UNITIZING!!! AND SUBITIZING!!! Soon after that, the fractions started rolling in. 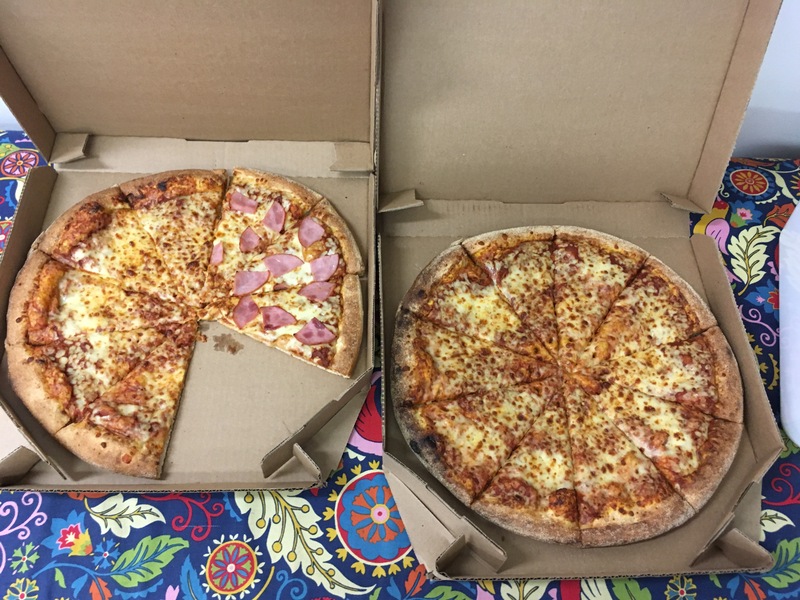 I asked, “What fraction of the pizza would a person have if they only had 1 piece?” I am super excited that 1 person said 1/10 since we’d established that 10/10 is a whole pizza. Nobody argued for 1/18, and nobody looked confused, so I call that a win. There is one milk missing. 9 can fit in the box. 1/8 of the milk are plain. 7/8 are chocolate. They went to fractions much quicker the second time. I asked what they would do if a class ordered more than 9 milks. 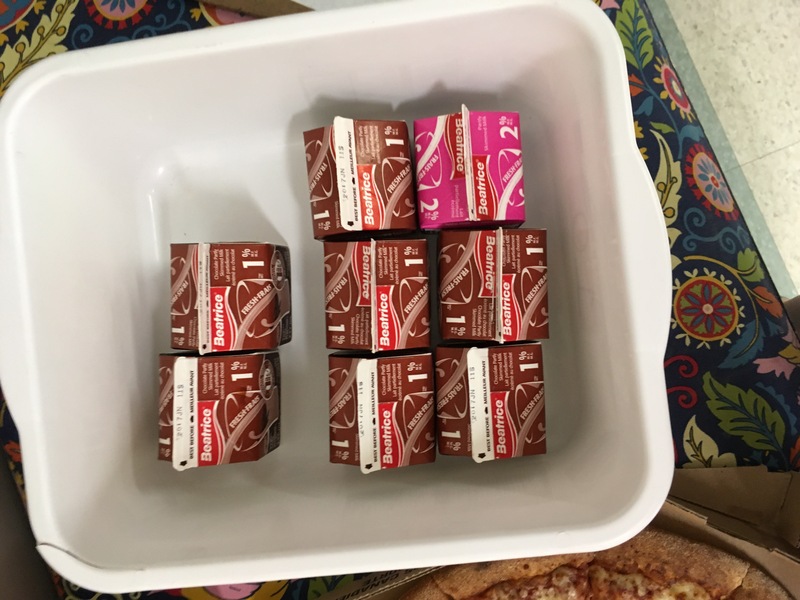 Most agreed you could stack the milk on top, but some thought a second box would be required. Overall, I am super-nerdy excited about how this went. It’s a contextualized problem, and one that they will encounter again because pizza comes every week. I am also thinking this could be a Guided Math centre question at the beginning of every month. The number of children who order pizza tends to change a bit every month. AND, we could take pictures of the pizza in other classes. I am going to teach fractions earlier next year just so I can do this! And then I am going to teach graphing so we can graph our results. I just decided that right now, so if you don’t see this reflected in my long range plans, please hold me to it!